The Beretta 93R is a selective-fire machine pistol, designed and manufactured by Italian firearms manufacturer Beretta in the 1970s for police and military use, that is derived from their semi-automatic Beretta 92. The "R" stands for Raffica, which is Italian for "volley", "flurry", or "burst" (sometimes spoken "R" as "Rapid" in English). 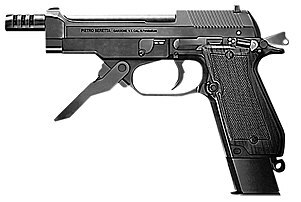 The Beretta 93R was designed to be used by the Italian counter-terrorism forces of Nucleo Operativo Centrale di Sicurezza and Gruppo di Intervento Speciale but was also adopted by other police and military forces who required a concealable weapon with rapid fire capabilities. The pistol is a development of the Beretta 92 design. The Beretta 93R is mechanically similar to the Beretta 92. It can be selected to fire either a three round burst or single fire. A selector switch enables the operator to alternate between the two firing modes. The pistol is fitted with a vertical foregrip at the front end of the trigger guard to provide better stability when firing. A folding steel buttstock can be attached at the heel of the grip. The 93R is considered difficult to control when being repeatedly fired in burst mode because of the 1,100-round-per-minute firing rate. ^ a b c Thompson, Leroy (2012). The Beretta M9 Pistol. Osprey Publishing. pp. 12–13. ISBN 978-1-84908-837-4. ^ a b Fowler, Anthony (2007). Pistols, Revolvers, and Submachine Guns, p. 136. ^ McNab, Chris (2004). The Great Book of Guns, p. 145. ^ Jones, Richard D. Jane's Infantry Weapons 2009/2010. Jane's Information Group; 35th edition (January 27, 2009). ISBN 978-0-7106-2869-5.